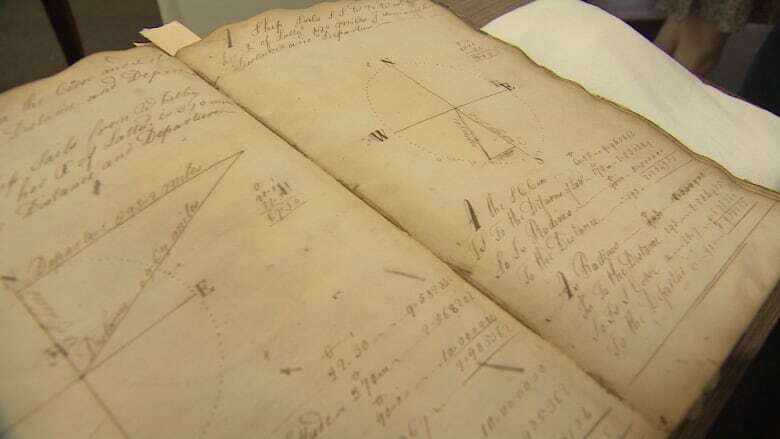 A replica of the journal of Captain William Frankland, dating back to the 1700s, offers Grand Manan residents a glimpse at the early history of the island. The journal of one of Grand Manan's prominent early residents has been returned to the island, with help from the New Brunswick Museum. Wednesday in Saint John, representatives from the Grand Manan Museum were presented with a replica of Captain William Frankland's journal, dating back to the late 1700s. Frankland began writing in it when he was 17, as a midshipman, and continued through his time as captain of the county militia. The journal chronicles his voyages and meticulously documents crew names. At more than 200 years old, the 150-page journal is very fragile, so the team at the New Brunswick Museum had a copy made for display in Grand Manan. Former Grand Manan Museum board president, Greg McHone, said he looks forward to reconnecting island residents to their history. "It's a part of the early history of the island that doesn't exist anywhere else, including a lot of information about island people who are still there, who are family descendants of folks who are named in this book," he said, noting the return of the Frankland journal to the island started with an ad on eBay titled: Grand Manan artifact. McHone said the island's museum — run mainly by volunteers — did not have the budget to beat a winning bid from Toronto, which is why McHone turned to the New Brunswick Museum for help. Felicity Osepchook, curator of the archives and manager of the research library at the New Brunswick Museum, worked to get funding to purchase it from the Toronto bidder. She said it took some negotiating with the collector, M. Benjamin Katz, but the two parties worked out a deal they were both happy with. "This is a really important piece of New Brunswick's documentary heritage, which we felt was important to see returned to the province, and preserved and made accessible to New Brunswickers," said Osepchook. She said Captain Frankland's story was so extraordinary, it needed to be displayed properly. "You have to admire anybody who, at that age, would go to leave their home, would venture into entirely unknown territory and become the first settler of an Island. That in itself tells you about the person." Osepchook said although the vellum-bound journal is in "fair condition," with detached covers and some loose pages, it wasn't fit for regular exhibit in its current condition, so a graphic design company in Saint John created the digital reproduction. The company's owner, Dawn Drew, said it took three weeks to finish the job, which aimed to keep the look of the journal replica as authentic as possible. "Due to the complexity of the book and the fact that fact that the book couldn't be opened on a flat surface, they had to be photographed on an angle …That meant every photo had to be retouched and remastered to be on a square plane and to be accurate to the original," said Drew. The New Brunswick Museum is applying to the Canadian Conservation institute in Ottawa to preserve the original Frankland journal. People on Grand Manan will be able to see the replica this summer, as part of a larger exhibit on the early residents of White Head Island.